“Creativity is defined as the tendency to generate or recognize ideas, alternatives, or possibilities that may be useful in solving problems, communicating with others, and entertaining ourselves and others.” Being creative is a part of my everyday life, it’s in my blood, and it’s my being. Working with others, my hands and my heart have led me to the journey I am now on. With this being said . . . one of the biggest creative events in my life recently was my daughter’s wedding!!!! I wanted to make my daughter’s day the most beautiful day she would ever experience. Having this desire and the capabilities allowed for my creativity to flow. Many things were crafted and sewn with love . . . although, I have to admit, I became stressed on many occasions throughout this process! Everything, in my eyes, had to be perfect for my daughter! 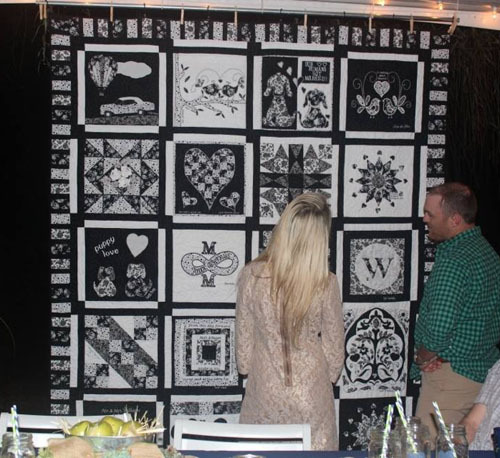 What I consider the most special creation of all was a memory quilt made by women of all ages, family and friends of both our family and my daughter’s fiancé’s family. My mother, my mentor, and the person who nurtured my creativity and taught me to sew is the person who initiated this project and saw it through to completion. 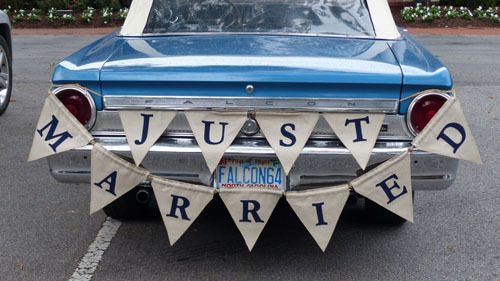 This entire project was to be a surprise for the newlyweds. “squares.” My mother and I volunteered to blanket stitch around their designs. Given a little idea, they flourished and put their heads and hands to work. 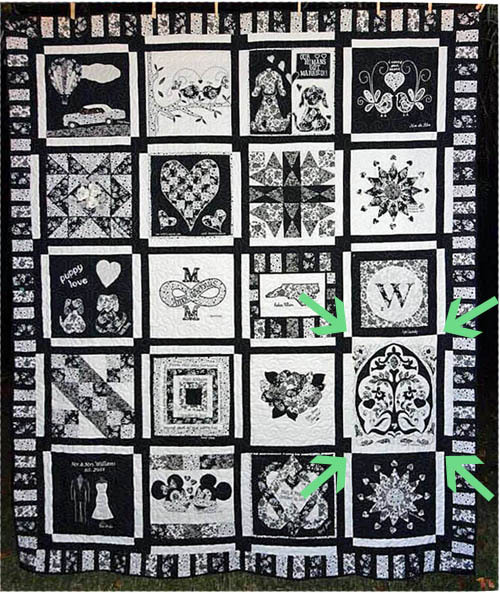 A deadline of August 1st was given so that there would be time to piece the squares together, get the quilt quilted and bind the entire thing by the Wedding date of October 19. Quilt squares were still missing and trickling in by August 14th. THEN, one quilt square arrived double the requested size, and an aunt who didn’t sew and didn’t volunteer originally wanted to be represented . . . No worries, we creative people work well under pressure and can “recognize ideas, alternatives, or possibilities that may be useful in solving problems!” I got to work and digitized a North Carolina appliqué for her and my aunt had her representation! 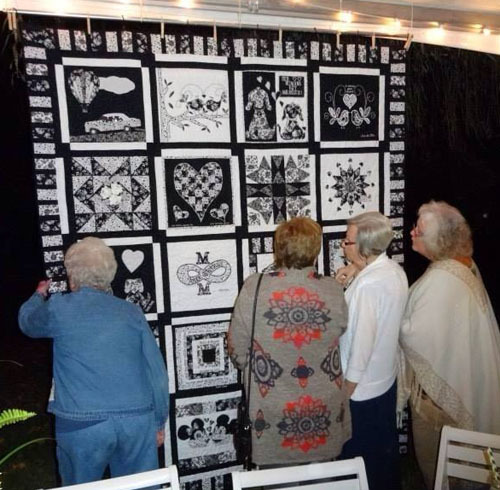 Three talented family members flew into town mid-August to help piece the quilt and decided on a solution to the unanticipated larger quilt square. All was well, so it seemed. My mother, the three relatives and I set up our work area in my mother’s dining room with two sewing machines, plenty of cutting space and an ironing board. The ideas, creativity, laughing, sewing, texting, sewing, laughing, texting, hiding, scheming, sewing, etc. began. All of this being done while my daughter and her fiancé were going in and out of my mother’s home stopping over to visit with our relatives. Hence the texting, sewing, texting, hiding, scheming! My daughter and her fiancé never suspected a thing! As we worked closely together discussing design options, making decisions, sewing , scheming and hiding our project from view when need be, we grew closer as a family unit. Our exhausting four days straight of piecing together an entire quilt definitely had us “entertaining ourselves and others”! My daughter and now husband were presented with this gift, made from love, at their rehearsal dinner. They were surprised and overwhelmed at the time, talent, and creativity that was poured into a gift they will cherish for a lifetime! The BERNINA 830 was used in creating many of the quilt squares. BERNINA Embroidery Software 6 was used to create several of the quilt blocks. And the BERNINA 730 was used in the piecing and finishing of the quilt. Next Next post: What Size Zipper Should You Choose?